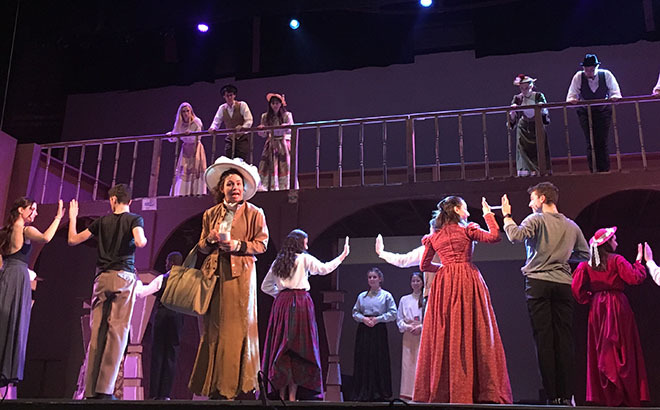 The first weeks back in the winter quarter can be a cold and sad time, but the 77th Annual Dolphin Show, Hello, Dolly!, is bringing warmth and joy in spectacular musical fashion. The Dolphin Show, which contains no aquatic animals, is the largest student-produced musical in the U.S. What started as a fundraiser for an elite men’s swimming team in 1940, then named the Dolphin Club, evolved into a student-run musical extravaganza. Every year, over 150 students join the cast and team of The Dolphin Show, which this year is directed by Communication senior Isabel Perry and produced by Communication seniors Casey Watson, Andrew Harlan and Austin Manross. Hello, Dolly! is a 1964 musical with a score by Jerry Herman, and its 2017 revival won Tony awards that year. The show, set in 1896, tells the story of how socialite-turned-matchmaker Dolly Levi whisks the wealthy bachelor Horace Vandergelder and a gaggle of other characters from the small town of Yonkers to the lively New York City to find love. School of Communication sophomore Peter Carroll plays the crotchety Horace Vandergelder, who, though wealthy, is quite stubborn and stingy (he goes to a fancy restaurant and orders two bowls of rice). He doesn’t see much value in a woman besides her ability to tidy things up around his hay and feed shop in Yonkers. Dolly, played by Communication senior Christina Layton, assures Vandergelder that beautiful socialites await him in New York City, while she has set her eyes on him, or rather his money. However, over the course of the show, both characters develop feelings for each other. The show feels like a fantasy, with entire plot taking place in nearly 24 hours. The play is one nonstop adventure with comedy and love triangles galore. “We wanted something really joyful and happy. We just wanted something magical, that would give people two hours of laughter and fun,” said producer Casey Watson. Watson said anyone who wants to be on the Dolphin team can be, as she and the other producers all started working on The Dolphin Show as freshmen. She said they work hard to make the freshmen they recruit feel comfortable. Few theater productions get access to the Cahn Auditorium, so Watson says they wanted a show that would do such a grand space justice. Communication senior Jessie Baldinger was in charge of designing the set and has worked on The Dolphin Show for four years. “I love The Dolphin Show because it’s all these people coming together to do something huge and crazy and totally stretching ourselves as far as we can,” Baldinger said. Everyone on the team has to commit hours to help build the massive set. This year, Baldinger said she wanted to capture the essence of the setting in physical objects. She said she “thought a lot about how objects experience joy.” She designed set pieces that don’t follow architectural rules or even obey the laws of gravity. Costume designer and Communication senior Lena Dudley helped bring this period piece to life by creating extravagant gowns and flamboyant hats straight from this historical era. She compared constructing the hats to doing arts and crafts, as she had to hot glue fabrics, sequins, buttons and feathers onto hat frames. “When they said it was Hello, Dolly! I was really passionate about it because it’s such a costume heavy show, and there’s so many pieces in this show,” Dudley said. Hello, Dolly! will play from Jan. 25 to Feb. 2 in the Cahn Auditorium. To purchase tickets visit nudolphinshow.org/tickets.